Liberal gun hater Justice Stevens, in a 2006 photo. 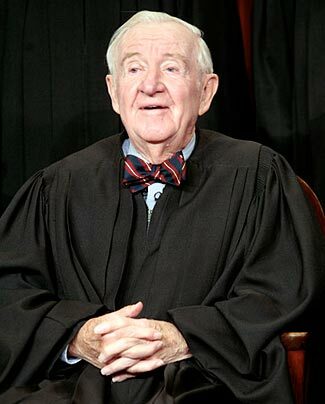 John Paul Stevens was the nation’s third longest serving justice on the Supreme Court, having been appointed by President Ford in 1970, and retiring in 2010 (allowing for Obama to replace him with Elena Kagan, who Stevens described as ‘a brilliant justice‘). Although nominally a conservative prior to his appointment, Stevens generally sided with the liberal side of the court (in case that isn’t obvious from his quote about controversial Kagan). And so, unsurprisingly, he is also anti-gun, having taken the losing (anti-gun) side in both the two huge Supreme Court Second Amendment cases in recent times – Heller in 2005 and McDonald in 2010. Although now thankfully retired, he is unable to keep quiet, and this article reports him offering up unwanted advice about how he believes that some classes of firearms can still be lawfully banned, as could also carrying of weapons pretty much anywhere. About the best news part of this is that having been wrong twice in the two recent Supreme Court decisions, the chances are he remains consistently wrong on these matters too, and that he is confusing wishful thinking on his part with the actual law of the land. Stevens also had a recommendation for people who keep a weapon in their homes for self-defense purposes. “Maybe you have some kind of constitutional right to have a cell phone with a pre-dialed 911 in the number at your bedside and that might provide you with a little better protection than a gun which you’re not used to using,” he said to laughter. Unfortunately, the laughter that greeted this comment was unlikely to be laughter at the idiocy of his statement, being as how he was making it to the Brady Center to Prevent Gun Violence’s Legal Action Project. His comments, and his judicial record, expose two ugly truths. The first is that Supreme Court judges may be experts on the law, but they are seldom experts on the matters they are required to apply the law to (in this case, the best way to respond to an intruder threatening you in your own home). The second and sadder of the two is that Supreme Court judges will sometimes let their own personal ideologies interfere with their supposedly neutral interpretation of the law. However, supporters of the Second Amendment can take encouragement from one thing he said. A spurious argument raised by some anti-gunners is that the Second Amendment only covers weapons that were available in the mid/late 18th century, not more modern weapons such as are available now. But when Justice Stevens refers to constitutional rights to cell-phones with pre-programmed speed dial numbers, he clearly accepts that the Constitution applies not only to the things in place when it was written, but to derivative and more modern things that have subsequently been created. Such as, for example, semi-automatic pistols and fully automatic rifles.